After breakfast at the hotel in Moshi you'll be driven to the Tarangire National Park for a wildlife safari, known for its enormous elephant colonies. You'll have lunch in the park. When the sun sets you'll drive to the nearby and peaceful Endoro Lodge for a fabuous dinner and overnight stay in your own private chalet. In the morning you drive to the Lake Manyara National Park where you'll have lunch during the safari. After lunch your driver will drive you back to the Endoro Lodge again for dinner and overnight stay in your private chalet. After breakfast your driver will drive you from the Endoro Lodge into the famous Serengeti for a wildlife safari. After a lunch inside the national park you'll have dinner and stay overnight at the Kati Kati Camp, just outside the Serengeti. After breakfast at the Ikoma Bush Camp you'll experience another wildlife safari through the Serengeti and then drive to the Ngorongoro Conservation area for dinner and overnight stay at the Ngorongoro Sopa Lodge, on the edge of the crater. After breakfast at the Ngorongoro Sopa Lodge, your experienced guide will drive you down into the Ngorongoro Crater area for a wildlife safari. Later in the afternoon, after lunch inside the crater, you are driven back to the hotel in Moshi and stay there for the night. This 5 Days Safari option is available for US$ 1,975.- per person (minimum of two participants). After breakfast at the Endoro Lodge your driver will drive you to the Serengeti National Park via the Olduvai Gorge where you'll visit the historical site. Once the registration at the Serengeti park gate is done, you'll have a first wildlife drive through the national park. At the end of the afternoon you'll arrive at the Kati Kati Camp for dinnar and overnight stay. After breakfast you'll do a full day safari drive (with a sunset game drive during the dry season) in the Serengeti National Park with game viewing in the southern Serengeti & Seronera Valley. At night you'll have dinner and stay overnight at the Kati Kati Camp once more. In the morning continue with a last safari drive through the Serengeti National Park, then later proceed to Ngorongoro Conservation area for dinner and overnight at the Ngorongoro Sopa Lodge. 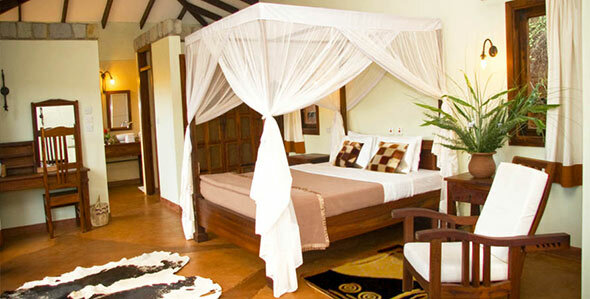 This 5 Days Safari option is available for US$ 2150.- per person (minimum of two participants). You can pick any date of desire for this safari. Please contact me if you wish to book this safari.